The design brief for the accessories supplied by Alice Made This is 'engineered simplicity'. This equates to timeless designs combined with innovative British production techniques that range from the ancient silversmithing of Birmingham's Jewellery Quarter to electroplating methods typically reserved for the electronics industry. The Osbourne cufflinks (below) are the epitome of such innovation. 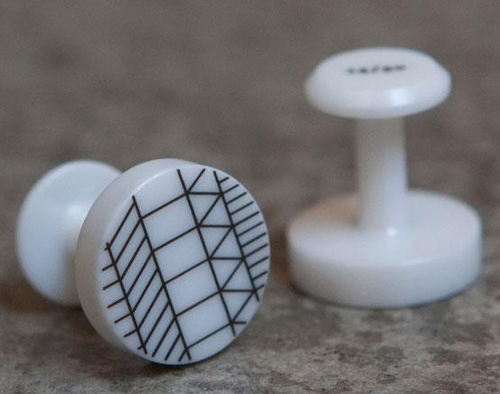 The cufflinks are made in a limited edition batch of 50 from a ceramic material that is harder than steel. 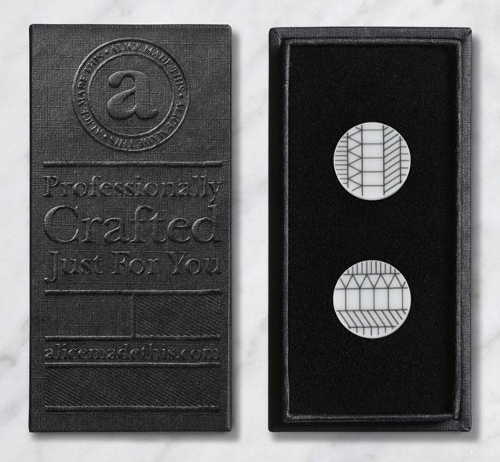 The pattern and edition number is laser etched into the cufflink. They look very elegant. I'm thinking one's initials might have made a nice alternative to the limited edition number, but I'm not complaining. Technox 'ceramic steel' (from Dynamic Ceramic) is used in Formula One car engines and other industries where its strength and wear and corrosion resistance make it a highly useful material. 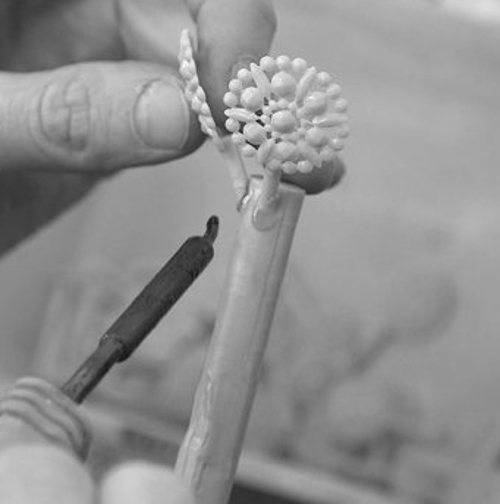 From a high-tech process to an age-old process, the George lapel and tie pin from the Royal Household collection is made in London's Hatton Garden Jewellery Quarter using investment casting that starts with a wax design that is used to make a cast. The process is described here. 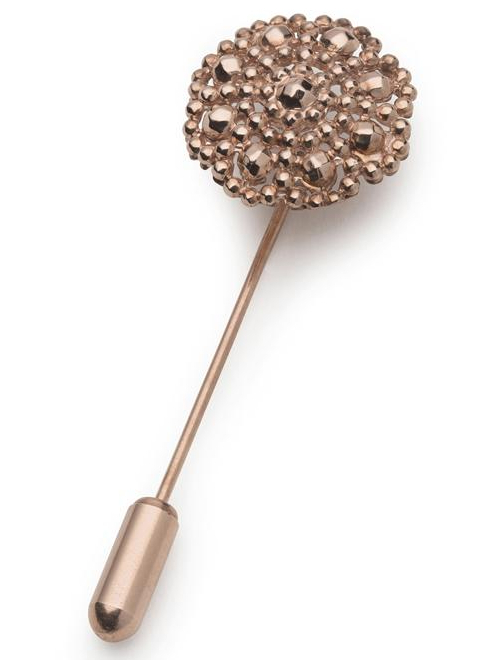 Inspired by the decorations on an 18th century couturier's dress, the pin is made from rose gold plated over bronze. Look closely at the lovely intricate detail at the head of the pin. AMT advises that you should have fun with your accessories. 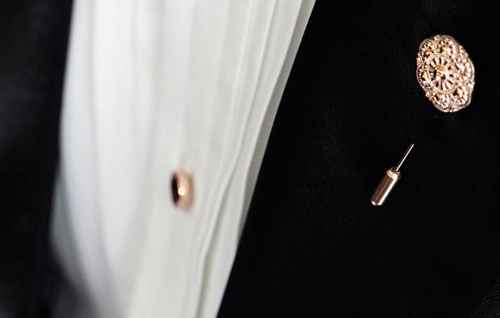 They suggest to wear a pin on your coat, tie or jacket, a jumper even. 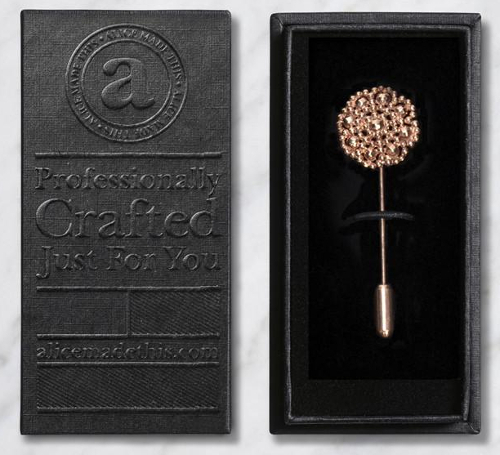 Of course, for those big occasions a lapel pin is really going to come in to its own. As for you, I know you're happy to wear things like this even for a trip to Waitrose. I don't blame you. Why not?